Emerson Climate Technologies employee Stephanie Wilson presents a check for $100,000 to Sidney City Schools Superintendent Bob Humble. The donation is for the air conditioning project in the music wing at the high school. SIDNEY — Three donations for the Sidney High School music wing air conditioning project were accepted during Monday nights’ Board of Education meeting. The board also adopted the calendar for the 2020-21 school year. Stephanie Wilson, Emerson Climate Technologies employee, told the board Emerson was glad they could assist with the project. The company donated $100,000 to the project. Wilson is also the president of the Sidney Music Boosters. 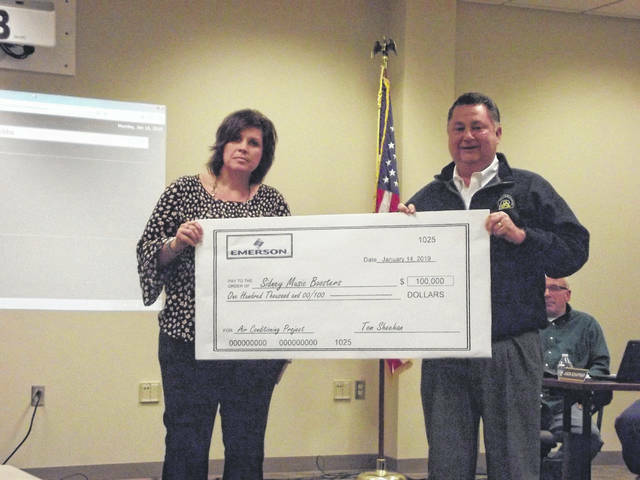 Dave Ross, of Fort Loramie, a SHS graduate and longtime supporter of the school district, donated $75,000 for the project. Ross, who was unable to attend the meeting, sent a message to Superintendent Bob Humble concerning his donation. The board also accepted a $1,000 donation from Gateway Arts Council for the project. Gibbs said Wilson, on behalf of the music boosters, wrote a grant application to Gateway Arts Council for the project, explaining that the air conditioning will help preserve the instruments and protect them from the heat and humidity..
“We knew we had to contribute,” said Gibbs. Gateway Arts Council Executive Director Ellen Keyes was also present for the donation. According to Treasurer Mike Watkins, the equipment for the project has been ordered and blueprints have been approved. A planning/organizational meeting with the equipment vendor and contractors to kick off the project will be held Friday, Jan. 18. After the summer vacation, students will be returning to the classroom after Labor Day for the 2019-20 school year. The calendar, approved Monday, calls for the first day of school to be Tuesday, Sept. 3. According to Superintendent Bob Humble, 30 minutes was added onto each school day so the district could start the year after Labor Day. Staggered kindergarten start days will be Sept. 3-5 with all kindergarten students in class on Sept. 6. Winter break will be Dec. 23, 2019, to Jan. 3, 2020, and spring break is planned for March 16-20, 2010. The last day of school for students will be Thursday, May 21, 2020. • Accepted a settlement agreement with Low Voltage Solutions. The agreement deals with the security door project and there were issues with the equipment not be compatible. The district moved forward with a different system. • Approved the purchase of property at 2110 St. Marys Ave. at a cost of $279,000. The property will be used as a maintenance facility for the district. In the future, all buses will be parked at that location. • Approved a list of 38 students who have completed all requirements for early graduation. The requirements were met in December. • Approved two out-of-state trips for students. The eighth-grade students will be going to Washington, D.C., May 29 to June 2. Travel will be arranged by K&K Tours of Celina. Trip expenses will be paid by the students. The second trip is for the competition cheer team to compete in Orlando, Florida, March 14-18, Trip expenses will be paid by team members, boosters and athletics. • Heard a legislative report from board member Mandi Croft. She said pending approval, Michael Toal, president of Everyday Technologies, will be appointed to the state board of education. • Learned Bill Ankney has been elected president of the Upper Valley Career Center Board of Education. • Hired James O’Leary as a substitute teacher at $90 per day. • Hired classified substitutes Pamela Bynum, cook, $10.06 per hour; Jamie Fridley, custodian, $14 per hour; and Jason Martin, $14 per hour. • Awarded supplemental contracts to Laney Shaw, assistant music director, $1,161; Tracy Nuss, Tori Purk, Marissa Thompson, Troyann Freytag, Bill Rippey, Sam Young and Brenda Spangler as Sidney Middle School T3 tutoring program at $26 per hour. The board’s next meeting will be Tuesday, Feb. 19, at 2 p.m. at the board of education office.